With summer has come longer days, hotter sun and better reasons to drive off into the countryside for leisurely lunches. Although country restaurants in Gauteng are a-dime-a-dozen, I feel that top class spots, serving fine cuisine, are few and far between. I had eaten at Roots numerous times, and it was high time to go and get reacquainted with this spectacular place. Sprawling sedately alongside a large lake, Roots sits at the epicentre of Forum Homini, a boutique hotel which embraces the remarkable heritage of the Cradle of Humankind. A subtle structure with grassed rooftops, Forum Homini blends into its natural surroundings. Warm-hued woods pick out gorgeous vistas across the lake, and vast glass doors circulate light and veld-scented breeze. Roots exudes understated chic; luxurious materials, simple cutlery and fine-cut glassware lend to the feel of country oasis. Happily seated at one of the prime tables on the wooden deck, overlooking the glittering lake, we ordered G & T’s and got down to the menu. Roots offers a uniform tasting menu which changes daily, depending on seasonality and ingredients. They are very accommodating of dietary requirements and preferences, which will be noted when you book. Sunday lunch is generally 6 courses. The restaurant boasts a well-stocked cellar and there is the option of having “wine teasers” with your meal. This is really worthwhile, giving one the chance to have a specially selected wine with each course. We started off with roast pear and chestnut soup, prawn toast, orange puree and cauliflower. It was cleverly presented, with all the components beautifully arranged in a large bowl, the soup poured over these at the table. 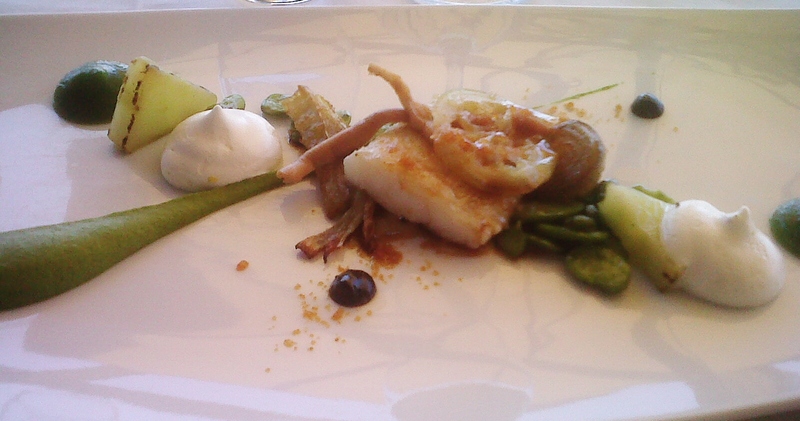 The dish was paired with a Weltevrede “Vanilla” Chardonnay, 2011. I was quite taken with this wine – it had a rich, vanilla taste which complemented the fruity undertones of the soup. The second course was roast monkfish and octopus, served with pea and mint, grilled cucumber, braised fennel, broad beans, liquorice and lime confit. This was paired with a Bouchard Finlayson Blanc de Mer 2011 and was a light and appetising course. One of my favourite dishes was up next: A medley of quail, crayfish and pork belly with squid-ink jellies, verjus and roast parsnip, served in a smoked tomato and prawn broth. The gamey-salty quail, sweet, tender crayfish and soft, buttery pork belly made for a luxurious combination. The dish was gorgeous, a tantalising tease for the senses. The accompaniments brought the individual elements of the dish together. Squid-ink jellies were a particular touch of genius – black cubes adding colour and texture, their unique flavour serving to offset the richness of the other components. With the quail we enjoyed a Thunderchild Red Blend, 2008. Many probably haven’t heard of it – a well-made wine with a good cause. Originating from the Robertson region, Thunderchild is the product of a community project established to raise funds for a local orphanage. These orphans are the “Thunderchildren”, many of whom come from stormy backgrounds. The ultimate was the meat course: Duo of springbok with red cabbage puree, capers and anchovy, parsley potato and mushroom mille-feuille and sauce charcuterie. This dish was exquisite in every way, beautifully presented and utterly mouth-watering. 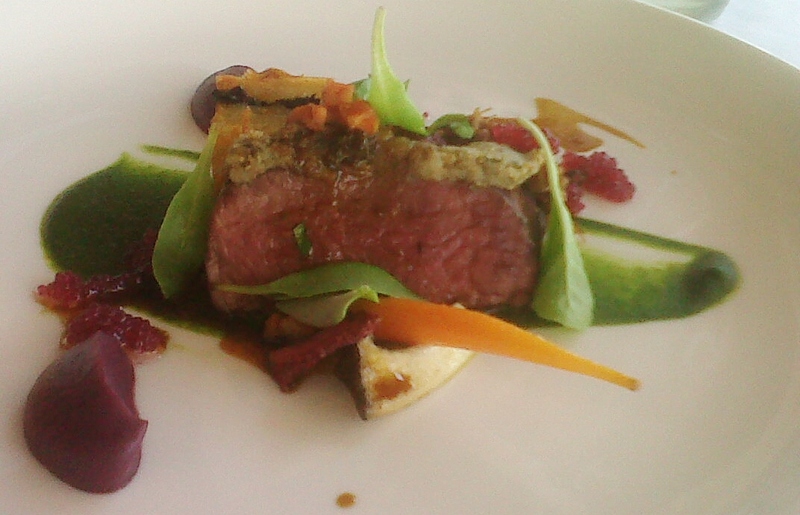 The springbok was perfectly pink and juicy, with the tastiest crust of capers and anchovy. Vegetable components were prepared with skill, the flavour balance wonderful. Topping off this succulence was a heavenly sauce – rich, meaty and with a real depth of flavour. This is game at its best, a brilliant combination. Duo of springbok with red cabbage puree, capers and anchovy, parsley potato and mushroom mille-feuille and sauce charcuterie. The main course was proceeded by a tasting of goats cheese, served on brioche rounds with salted caramel, grapes and rose. Salted caramel is high-fashion food at the moment, and it was interesting to taste it with cheese. I found the combination a bit sweet but my fellow diner thought it was delicious. The cheese was expertly paired with a De Krans Cape Ruby Port, the sweetness of the port balancing out the caramel and adding another dimension to the dish. Desert was a Roots Chocolate Plate consisting of chocolate delice, white chocolate sorbet, mint, passion fruit, coffee, pomegranate and brandy snaps. Once again, the presentation was immaculate and the dish a success, the brandy snaps a welcome textural contrast from the softer chocolate components. The service at Roots was generally good. Staff were attentive and accommodating, the wine stewards particularly interesting and knowledgeable. I was a bit disappointed that some of the dishes were not explained to us as they were served – always preferable when there are several, artful components to any given course. There are few things more pleasant than enjoying a good meal, delicious wine and great company. Add to this fantastic, hot weather and a vista of raw, African veld. One can almost see the heat swirling outside, yet Roots is cool, comfortable and inviting. This is a most sublime environment in which to savour some wonders of country cuisine just outside Johannesburg. 2 aperitifs, 2 tasting menus, 2 wine teasers, 2 glasses of wine and 1 espresso came to R 1150.00 including tip. You can contact Roots on +27 (0)11 668 7000. This review was sent to the restaurant on 28th November 2012. Even the most ardent city-lover may occasionally crave a meal in a simpler, ‘out-of-town’ setting which is still sufficiently chic. Burnside’s Café delivers in bags. It’s something of an oasis. A cool, country-style restaurant in a popular area of Johannesburg. This is the perfect place to enjoy a long, leisurely lunch. Spring is in the Joburg air at the moment, prompting us to make our second visit to Burnside’s with a group of friends last Sunday. The restaurant itself is contained within a classic, old-Johannesburg house, set in a pretty garden. The lawn is beautifully manicured and a few well-placed flower boxes add splashes of colour. The stone water feature exudes calm. The interior is sparse, benefitting from a neutral palette and a soft touch, making it warm and welcoming. There is a large, terraced outdoor area which boasts premium tables for sun-seekers. One wing houses a small art gallery showcasing some really talented and interesting local artists. As it was a warm afternoon we stuck to white wine throughout our meal. We loved the icy cold La Motte 2010 Sauvignon Blanc and the Springfield ‘Life from Stone’ Sauvignon of the same vintage. The wine list at Burnside’s is exclusively South African. Some favourite easy-drinkers will surely add to the festivities, and those seeking something more sophisticated will also be satisfied. Although we were planning to settle in for the afternoon, we didn’t order starters. 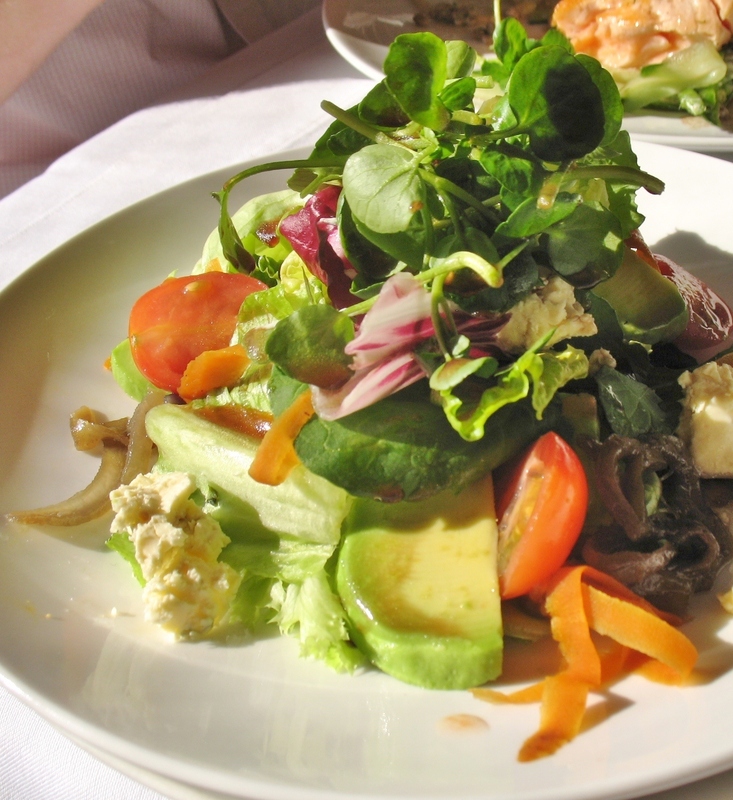 Whilst the menu is full of tempting dishes, the only starters available are salads. Granted, these are generous, creative and tasty – but those not partial to the greens might be disappointed. We felt that Burnside’s could benefit from adding some other starters to the menu. Otherwise, there is a great selection of wholesome, classic café food. A range of exciting sandwich options is available. The delicious chicken pot-pie with mushrooms and infused with garden herbs is a favourite, as are the hand cut chips accompanying it. There is also a good vegetarian variety. I’m told that the veg tart, with a filling of roasted veggies and thyme, topped off with creamy, melty camembert is a must. The menu is not particularly long, and the dishes are seldom changed, which could eventually prove problematic for those in search of variety. Between the six of us we really enjoyed the pickle-y beef burger (served with those famous hand cut chips) and the fillet – cooked perfectly to order. The linguine tossed with grilled zucchini and a lemonish vodka-cream sauce was wonderful. The pasta was cooked just fine, and the balance of flavours was fantastic. The lemony tastes really added depth and complexity to the dish. A generous helping of parmesan brought delicious decadence. It went well with a green side-salad pepped up with gorgonzola, pecans and grapes (not the standard side salad, but they are so accommodating that it was no problem to make a more exciting variation). The seared salmon served on a bed of lentils and draped with cucumber ribbons was a treat in the heat. It was super-fresh and beautifully cooked; enticing with numerous complimentary flavours and textures. Crunch from the sugar-snap peas and tangy acidity from the crème fraiche dressing brought the dish together beautifully. We also sampled some of the mouth-watering desserts. 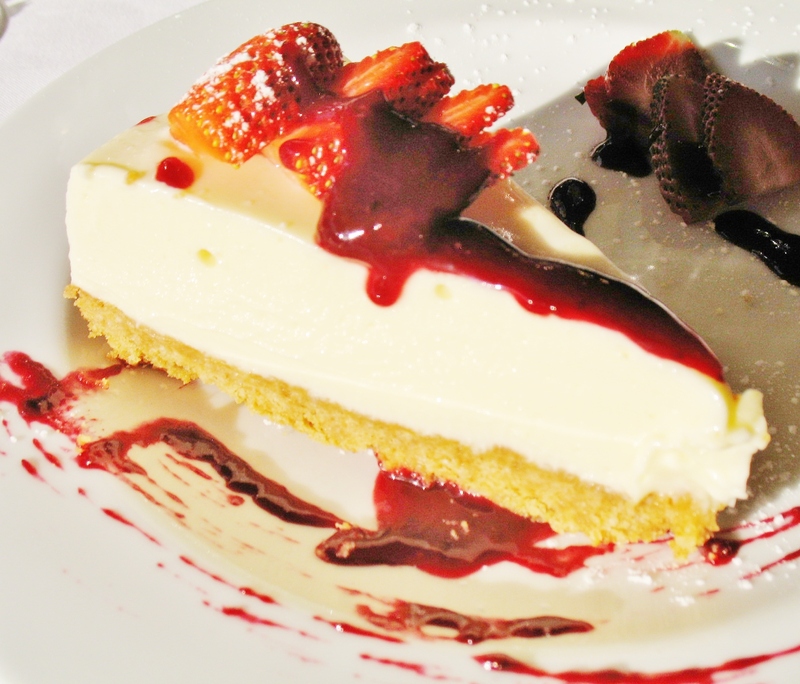 Burnside’s mascarpone cheesecake with ginger biscuit base was soft and silky – the texture rather more pleasing than the standard cheesecake one encounters. Served with a delicious, refreshingly acidic berry coulis, the flavours were heavenly and we had no trouble polishing-off large slices. 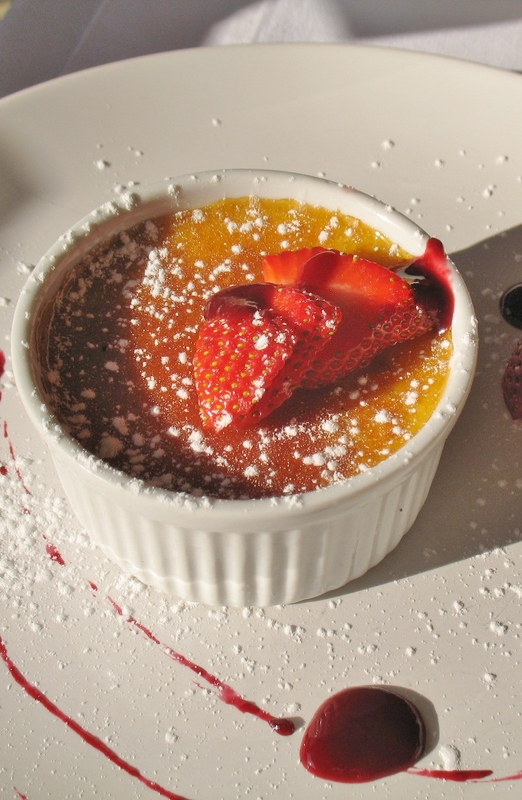 The crème brulée satisfied the palettes of the most discerning amongst us. All components were declared of a high standard, with the soft vanilla custard and perfectly caramelised top rivalling some of its French counterparts. The mini mascarpone berry pavlovas were pretty in pink and highly enjoyable. Burnside’s is not the kind of place where you would rush through a meal. The idea is to take your time, and enjoy yourself at your leisure. The service is equally relaxed. This is not to say it is bad, or that it is slow. Rather, the service is sedate, unobtrusive yet still necessarily attentive. Our waitress was affable, with a real sense of humour and a love for cricket. The staff were helpful and all food requirements were accommodated with the greatest of ease. Burnside’s is open for breakfast and lunch every day except Monday and it also opens for dinner from Tuesday to Saturday. You cannot make reservations for breakfast or lunch – so on a busy day you may have to wait for a table – and do enjoy a bottle of wine in the sun whilst doing so. It is recommended that one make a reservation for dinner. If you tend to suffer from the Sunday Blues, as I do, Burnside’s is the Sunday lunch spot for you. The atmosphere is conducive to relaxation, good times with friends, laughter and that general merriment which makes our lives so much richer. Any thoughts of the Monday-looming are quickly put out of mind, where they remain. Children are welcome and made to feel at home. Families enjoy long lunches and this is the perfect place to catch up with friends whilst soaking up the summer sun. 1 salad, 6 main courses, 5 desserts and 3 bottles of wine cost us R 1500 including tip. This review was sent to the restaurant on 27th August 2012.